Home » The Law & You » My Son Was Injured at Work. Should We Get an Attorney? My Son Was Injured at Work. Should We Get an Attorney? A viewer says his son was injured at work after a box fell on his head. They were considering whether they should hire an attorney. Workers compensation lawyers Greg Fellerman and Ed Ciarimboli give them legal advice. 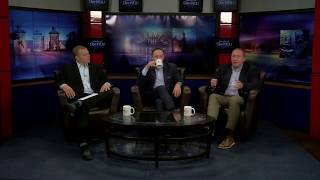 Dave Kuharchik: We’re addressing getting injured at the job at this edition of “The Law & You.” Guys who are always safe here in our studio, we take good care of them, are attorneys Greg Fellerman and Ed Ciarimboli. We like to give you guys sometimes like a spa experience. Greg Fellerman: I get that too. David: That happens. That camera does a little something to you. Ed: I took it as a compliment. Dave: All right, we’ll get to our question tonight. This involves Scott in Luzerne. He says,” My son was injured at work when a box of frozen food fell on his head. His neck is getting worse and looks like he has herniated disk. We are not sure if we need a lawyer.” What can you tell Scott? Ed: Well you absolutely do need a lawyer. There’s obviously a workers compensation claim that you’re going to have to file. I hope that you filed it contemporaneous with getting injured because one of the things these companies will fight on is if they weren’t given proper notice of a claim. So, if there’s a time period between when the box fell and struck your son, and now it’s weeks later and now you’re going to file the notice of the claim, you may have some problems and really run into significant resistance in this litigation from the company. Because they’re going to say, “Well geez, how do we know if this actually happened at work?” You really need to get to a lawyer quickly on this. Greg: The notice rule is 120 days but we tell everybody any time you are injured at work report it. Fill out a report, get a copy of the report, go to the doctor. Even if you don’t think it’s a big injury, you got to do it. Because if you don’t, that is the number one defense they raise in these workers compensation case — the notice. “Oh, we didn’t get the notice. Oh, it happened somewhere else.” Do yourself a favor, any injury at all, report it, go get treated, have a record. You’ll win your case. David: All right, and if you need help when you get injured on the job, the guys will take care of you. Call them up, check them out online. And don’t forget results matter. Attorneys Greg Fellerman and Ed Ciarimboli, we’ll see you next time, guys.